The option to prevent to send Frequently Forwarded Messages in groups is not available yet. For this reason, it’s ok if you have updated your WhatsApp version and it is not working for you seen that this feature is under development. Please be patient! In the 2.19.80 beta update, I’ve explained that WhatsApp was developing two new features: Forwarding Info (to know how many times a message was forwarded) and Frequently Forwarded Message feature, useful to discover if a message was frequently forwarded. But the sense to understand if a message was frequently forwarded is another: to prevent to send them! Yes, this is the next move to prevent fake news, but the choice is yours. 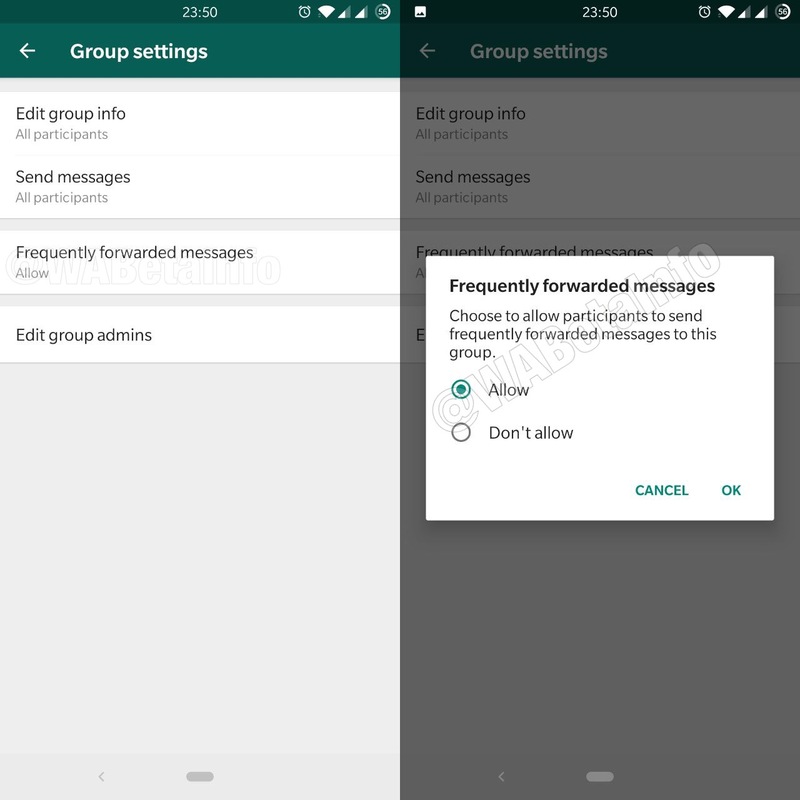 In the 2.19.97 beta update, WhatsApp is testing a new feature in groups that allows to choose to stop sending Frequently Forwarded Messages in the group. Don’t try to find it: the feature is not available yet, because WhatsApp is developing it. As you can see, this option will be available in future in Group Settings, and only administrators can see and edit it. If you are an admin and you don’t like this feature (maybe because you know that everyone forwards real news), you can choose to keep it disabled. When the feature is enabled, nobody will be able to send a frequently forwarded message in the group. Yes, obviously an user can copy the frequently forwarded message, sending it as a new message, but this action will slow the process. WhatsApp is currently testing the feature in this Android version. No tracks have been found in the iOS app, but surely they will test the feature later. We do not know when WhatsApp is going to enable the feature for everyone, but we will surely inform you when it is available. WhatsApp has recently enabled, in the 2.19.89 beta update, the new audio picker, with a new UI, the possibility to play the audio before sending it and to select more audio files to send! The roll out of the feature is completed. Previous PostPrevious WhatsApp beta for Android 2.19.87: what’s new? Next PostNext Spotted the WhatsApp for iPad official app, under development!